This week I’m performing Ligeti’s Violin Concerto with the Boston Modern Orchestra Project. The percussion part includes difficult passages for two tuned slide whistles. In addition to the finer points of tuned slide whistle, this article might also help to illustrate the sheer amount of collective effort it takes to put on an event like this. Dozens of musicians will play hundreds of thousands of notes during this concert. Even for me, the slide whistle part isn’t on my top 5 list of concerns. I also have tons of hard cimbalom notes to play. Aside from the musicians, there is also the administrative side of BMOP, raising the money to produce the event and handling all the logistics. All of that makes a few slide whistle notes being sort of in tune a relatively insignificant detail, yet several man hours went in to that task alone. 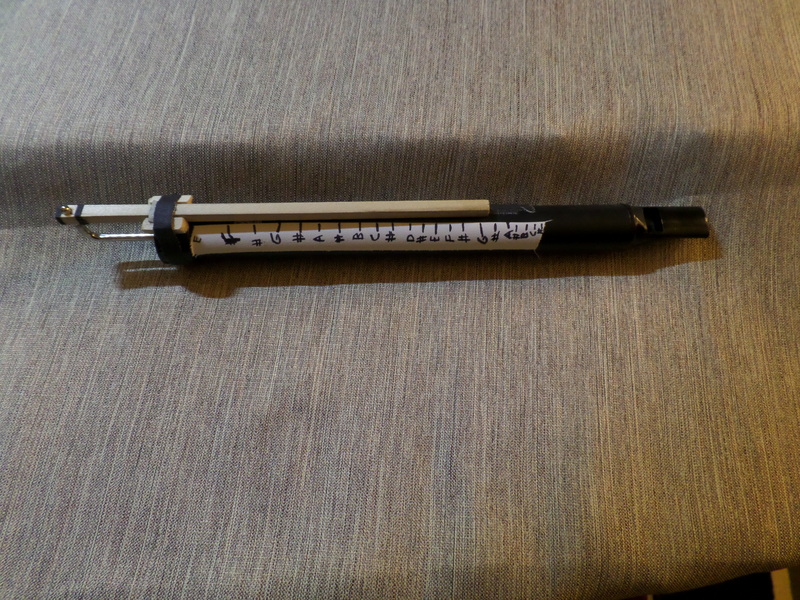 While spending an inordinate amount of time modifying a slide whistle, I often wondered “Does it really matter if these notes are in tune?” It would make my life a lot easier if it didn’t. But I remembered an experience I had 10 years ago playing Steve Mackey’s Eating Greens, which involves a comparably fussy part for tuned flexatone. I practiced flexatone for three hours to learn the feel of where the pitches were. At the first rehearsal, the conductor made me play the part with in unison with the violins, so in that case the practice paid off. Better safe than sorry. The slide whistle is typically used as a non-pitched glissando sound effect, but Ligeti writes specific pitches in moving lines, and if that wasn’t enough, he also has the two slide whistlers in parallel fourths. Given that it is written for slide whistle, I seriously doubt the intention is for it to be perfectly in tune, but I at least want to be in the right ball park. 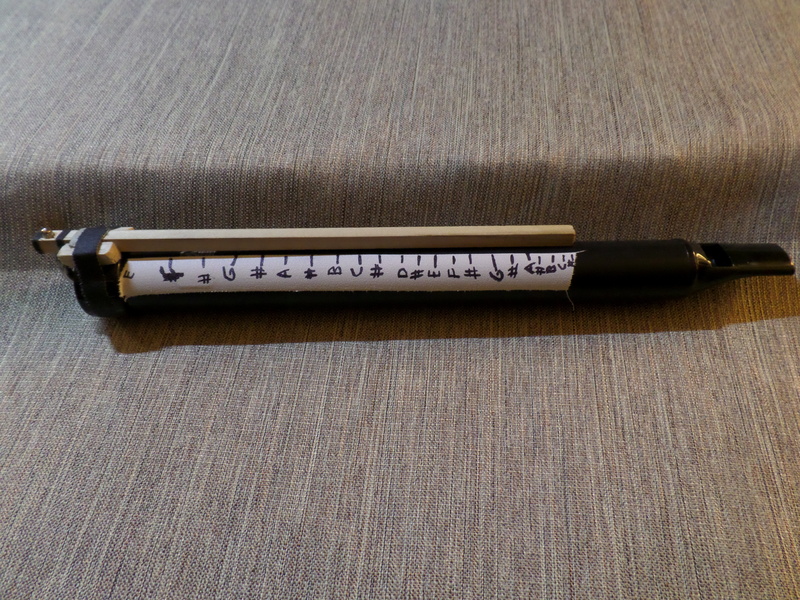 So I could either practice the slide whistle until I become so familiar with it that I can navigate the intervals by feel alone, or construct some sort of tuning gauge. I went with the gauge. This particular slide whistle worked well because of the L-shaped slide. It has a range of E4-C#6, not counting higher notes achievable through over-blowing. The actual process of making the tuning slide was not difficult, but coming up with the design took some effort. I asked some of my crafty neighbors if they had any ideas, but their suggestions were far too complicated. 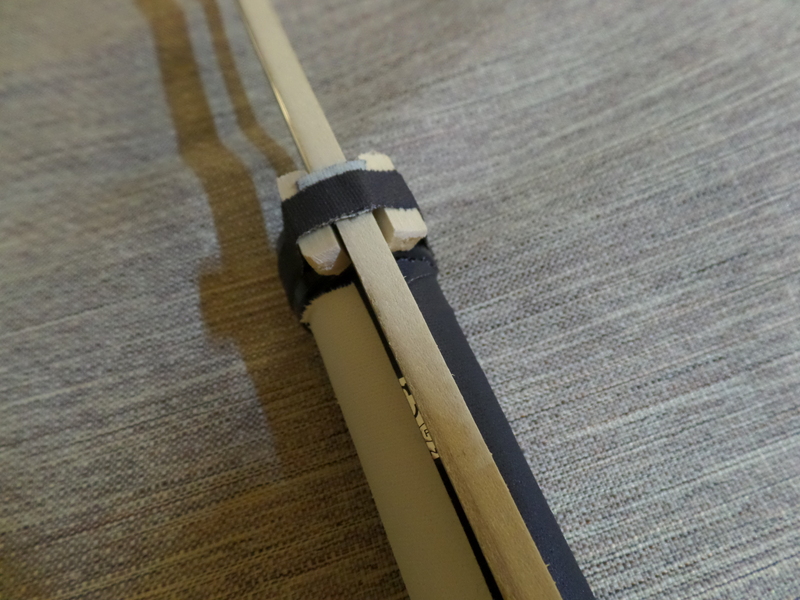 I ended up with a simple design using a square dowel rod, double sided tape, and gaff tape. 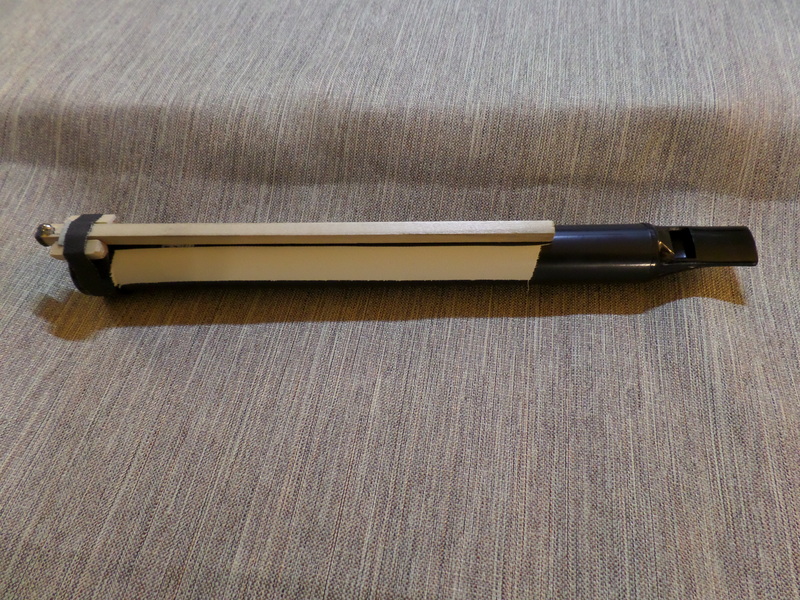 I cut a length of the dowel equal to the length of the slide whistle, drilled a small hole in one end, and attached it to the slide. I also used to small bits of dowel to keep the moving dowel centered on the slide whistle. I attached the two small bits with double sided tape, then gaff taped them all together. I then marked the pitches with black sharpie on white gaff tape. The end of the dowel rod marks the pitch. The cut bits of dowel rod. I didn’t end up needing the anchor nuts. 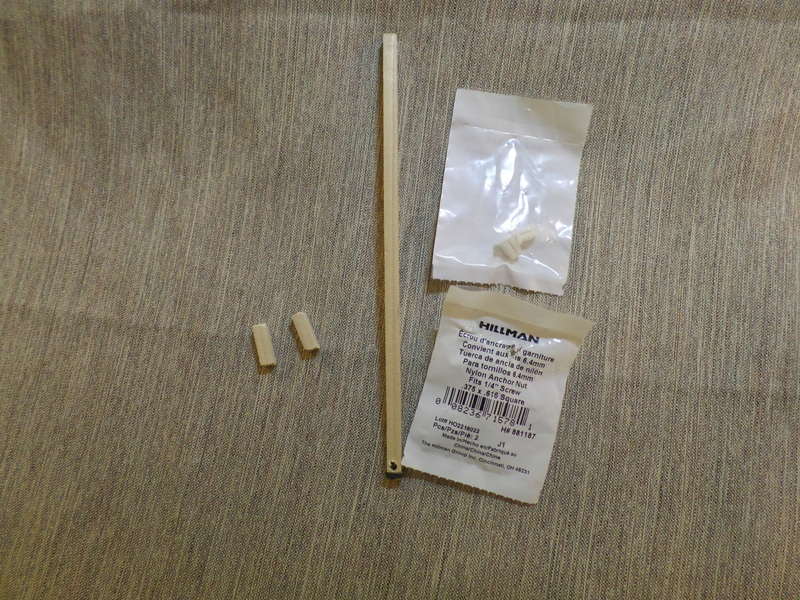 Dowels attached with unmarked tuning gauge. 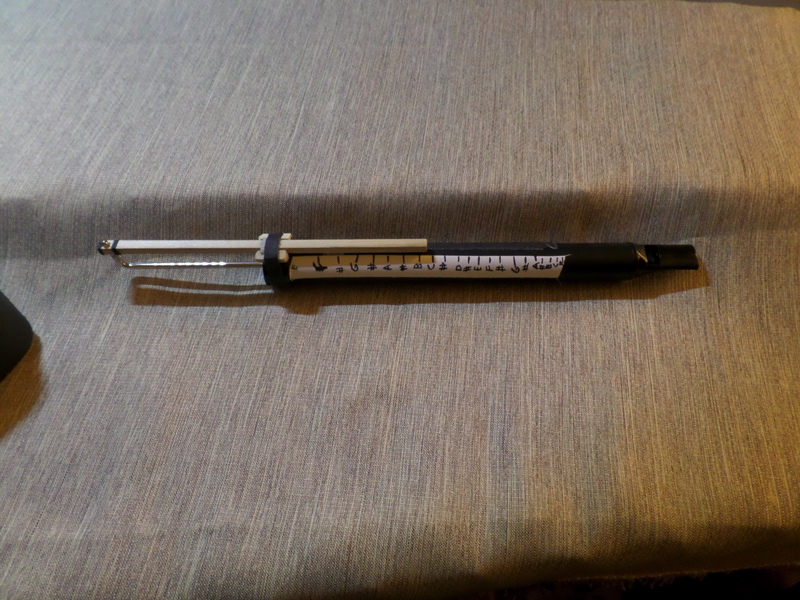 A few shots of the completed tuning gauge. Making the tuning gauge was somewhat frustrating because the pitch changes dramatically depending on the dynamic. So I guess beware of that if you have to undertake this project. It occurs to me that the ideal solution for tuned slide whistle would be for the body of the instrument to be transparent with the pitches etched directly on to it. The stopper inside the instrument could then act as the gauge. I was genuinely surprised to learn that Kolberg hasn’t thought of this already with a specially made “Ligeti Slide Whistle”. I bought a few other slide whistles in preparation for this part. Here’s some info on those. This one has by far the biggest range (D4-F#6 on the one I have. I’d be surprised that was consistent from instrument to instrument). It is also sounds a bit airy when played loud, as opposed to the Acme which has a more pure pitch. This one sounds as cheap as it looks. The range is A5-F#6. 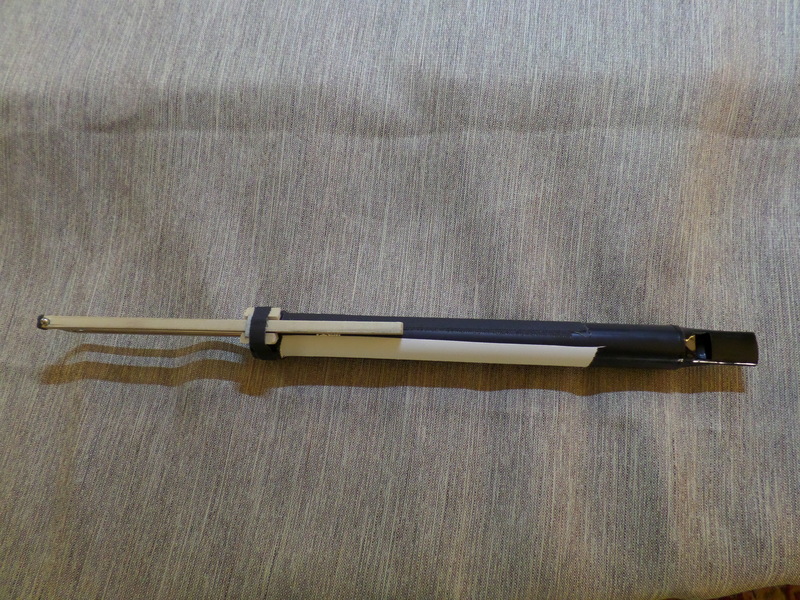 And here is a dog slide whistle. It has a one octave range of G4-G5. This entry was posted in Cimbalom, composition, Contemporary Music, DIY, orchestration, Percussion and tagged Ligeti, Percussion, slide whistle on January 22, 2015 by tolleism. I think the doggy whistle is the classy way to go. I enjoyed your slide whistle adventure. This was a really interesting post to read, thanks for putting it out there. I’m currently writing a part for a slide whistle, and finding it challenging to solve the issue of notation. I particularly appreciated your recommendations regarding the actual instruments. I have the metal slide whistle already, but I like the sound of the plastic one, it’s more similar to a recorder, I might try and get it. I have a few questions perhaps you may be able to help. If the composer wants a less defined and exact part, what is your preferred manner of notation? A three line stave? One line? With glissandi and articulation markings (or text underneath with explanations). I don’t need the part to be as exact as Ligeti’s but want it to be able to be replicated in some sort of accuracy! I have several sprechstimme moments or exchanges with a singer and child, and the slide whistle also participates in “dialogue”. I suppose a little bit like the Clangers (CBeebies children’s show) characters. The sprechstimme part I have decided to notate graphically (a la John Cage) so I suppose I could integrate some of those elements perhaps.